Outspoken pro-gun advocate and NRA board member Ted Nugent had a gun-free concert in Roanoke, Virginia on Tuesday. Fans were told last minute that they would not be allowed to bring their firearm with them into the Berglund Performing Arts Theater, WSLS-TV reported. 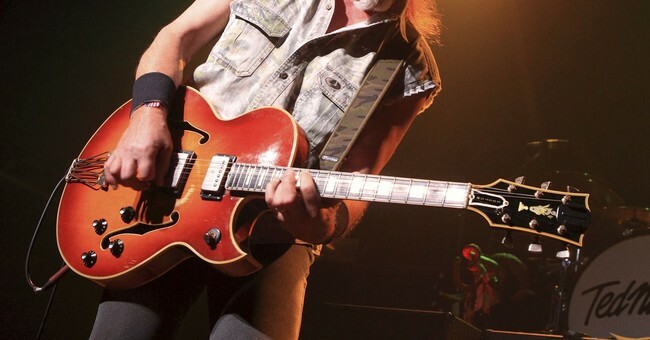 There was some apparent confusion between Nugent's crew and his tour promoter that wasn't shared with the Berglund Performing Arts Theater until just before they started to allow fans into the venue. "It happened about five minutes before we opened doors, we had a security meeting before we opened doors and the subject came up and we said, 'Yes people will be bringing firearms,'" Berglund Center General Manager Robyn Schon told WSLS. Nugent's crew disagreed. "Uh, no, our agreement says no." It turns out that the city-owned venue allows performers to dictate whether or not firearms are allowed during the concert. Nugent's sub-contract with his promoter had a line that said no firearms were permitted, which the crew must have missed. The line of fans waiting to get in where informed of the sudden change and told to take their guns and leave them in their car. Two people were turned away for having firearms on their person but most seemed to not know about Nugent's policy to allow fans to carry. According to Nugent’s spokeswoman, Linda Peterson, the venue forced patrons to leave their firearms in their cars. “Ted always allows legally carried guns into his shows," Peterson told the Orlando Sentinel. “The venue made an announcement requesting that people leave their guns in their cars without consulting us." The Roanoke Police Department had police presence at the concert, which is standard practice. They did, however, increase security but they declined to say if any significant threats had been received. Media access was not provided to news outlets who were interested in covering the event. Editor's note: the headline has been updated.